Enchanting Victorian interchangeable ring necklace with opulent opal and diamonds: Description by Adin Antique Jewelry. Antique jewelry object group: Ring and necklace. The diamond cluster with opal center can be attached on top of the ring or on the pendant of the necklace. Style specifics: Victorian - In 1837 Queen Victoria begins the longest reign in the history of Great Britain. For 64 years, from 1837 till 1901, she symbolizes the growth and triumph of the British Empire as Queen of Great Britain and Ireland and Empress of India. Proud, passionate about beautiful things, highly educated about all styles of time, she influences the lifestyles through her taste and immense love of jewelry. Technique: Although the back of this jewel is in yellow gold, the gemstones are set in 18K white gold/platinum. This finds it origin in a much older period where it was common for diamonds to be set in silver (see also explanation on silver on gold). Extra information: Opal - Opals are found in many colors, ranging from clear to white, gray, red, orange, yellow, green, blue, magenta, rose, pink, slate, olive, brown, and black. 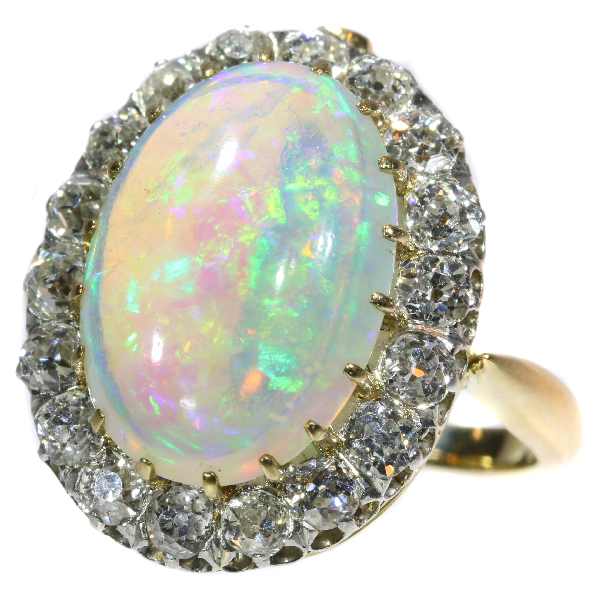 The mysterious opal can evoke as many convictions and superstitions, as it can twinkle colours. In the Arabic world, it was said that opals fall from the heavens during lightning storms. The Romans thought that this one gemstone beheld the power of all gemstones, because it displays all of their different colours at once. Diamond(s): One old European cut diamond with an estimated weight of ± 0.45ct. 18 old brilliant cut diamonds with an estimated weight of ± 1.26ct. Total diamond count: 19 pcs. Total diamond weight: approx. 1.71 crt. with an average colour and clarity: G/I, si. Precious stones: One natural precious opal with an estimated weight of ± 4.70ct. Birthstones: Opal is the birthstone (or month stone) for October and diamond for April. Signature: Marked "P" and "G" with a rooster of duck in between the letters, all within a lozenge outline. Perhaps referring to Galliano. Dimensions: Cluster length ca. 2,06 cm (0,81 inch) x width ca. 1,59 cm (0,63 inch) x height ca. 1,04 cm (0,41 inch).